Award-winning website gives fans details of big-screen event and access to tickets. The Crossroads Guitar Festival website announced Eric Clapton is coming to the big screen Aug. 13, 2013, when a film of the best of the highlights of his Crossroads Guitar Festival 2013 hits theaters for one night only. The Crossroads Guitar Festival website, which has been internationally recognized by The Communicator Awards, announced the special, theatrical event today and is offering fans access to theater locations and tickets to the show. It also offers a range of information to prep fans for what they will see in the film including the latest news about artists, the set list from the event, a photo gallery, and access to merchandise. Crossroadsguitarfestival.com was created by Gate6, a Phoenix-based digital agency, to keep fans up-to-date on festival news and information by allowing various event contributors to share new information as it happens. Eric Clapton’s Crossroads Guitar Festival 2013: Larger than Life on the Big Screen consists of behind-the-scenes footage and exclusive video from this year’s show. This limited release is coming to almost 500 select theaters nationwide for one showing Aug. 13 at 7:30 p.m., local time. The film includes performances, concert setup, backstage access with Eric Clapton and the other artists, sound checks, and more. Eric Clapton’s Crossroads Guitar Festival 2013 was a two-night concert event at Madison Square Garden featuring more than 30 of the world’s greatest guitarists. 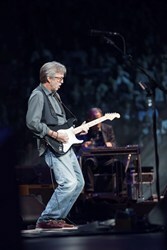 The concert benefited Clapton’s international recovery center, The Crossroads Centre in Antigua, which is a facility offering care for those suffering from addiction. For more information on the Crossroads Guitar Festival and to get tickets to the theatrical release, visit http://www.crossroadsguitarfestival.com. Gate6, a leading digital agency, has been voted the No. 1 Web Design Firm for four years running by the Phoenix Business Journal. With the strategy resources of a large agency and the personal attention of client-focused teams, Gate6 delivers measurable results for every client. Gate6’s technical roots make its creative ideas, award-winning designs and fully integrated marketing services possible. Visit http://www.gate6.com for more information.